Roctate - Identify. Quantify. Control. by discovering what is missing and what might happen. Roctate provides perspective on what matters most. Focusing on the major aspects of each development phase. Isolating the key issues that give cause to question the underlying basis and has the potential to impact, either in a positive or negative sense, the intended outcome. Clearly identifying, evaluating and clarifying sources of uncertainty support buy-in and ownership. 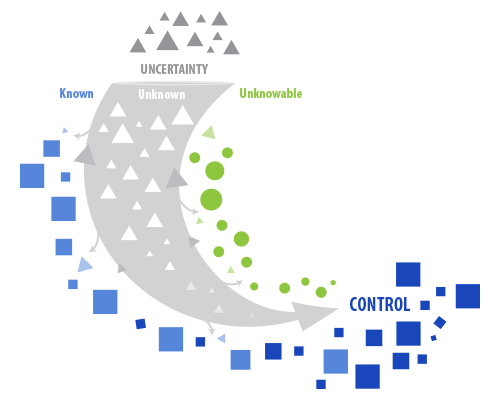 "Uncertainty involves variables that are unknown and changing, but will become known and resolved through the passage of time, events and actions. Traditional analysis is typically focused on known factors and unknowable factors can be hedged by insurance or other actions. Focusing on unknown factors provides the most significant potential for value improvement, particularly in early stages of development. 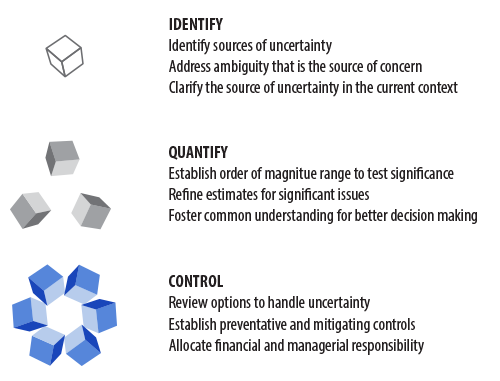 Resolving gaps in knowledge requires insight into the underlying uncertainty. At any given time a project depends on a mixture of what is known (at least partially), assumptions and what is largely unknown. Roctate develops capital and operating cost estimates, plans, schedules and risk analysis in a model that shows the potential impact of what matters most. © 2015 ROCTATE | control. All rights reserved.